Russia will counteract the U.S. plans to deploy new tactical nuclear bombs in Germany, Kremlin press secretary Dmitry Peskov has said. Russia will counteract U.S. plans to deploy new tactical nuclear bombs in Germany, Kremlin press secretary Dmitry Peskov has said. "This may upset the strategic balance in Europe. Hence, Russia will naturally have to take countermoves, countermeasures for restoring this strategic balance and parity," Peskov said on Sept.23. "Indeed, this is not a step towards bolstering stability, confidence and security in Europe," he said. "This is definitely another step, unfortunately a very serious one, towards the escalation of tensions on the European continent," Peskov said. Considering the decision of the German parliament, the United States "is making steady progress" in the deployment of new types of nuclear weapons, the presidential press secretary said. As to what countermeasures Russia may take, Peskov said, "these are the steps required for the provision of the national security of the Russian Federation and strategic parity in Europe." 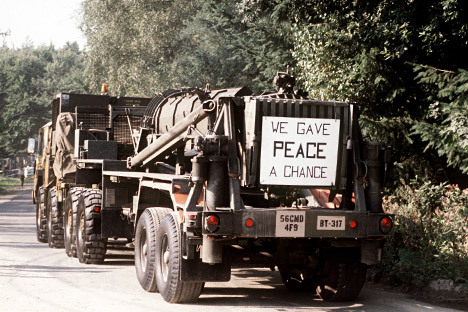 The Deutsche Welle radio said on Sept.22 with reference to the German channel ZDF that the United States was about to start the deployment of a new type of nuclear weapons at the German Armed Forces' Buchel airbase in the Rheinland-Pfalz land. The television channel supported its claim with U.S. budget plans envisaging the possibility of arming German Tornado attack aircraft with new nuclear bombs B61-12 already in the third quarter of 2015. Experts told ZDF that tactical nuclear bombs B61-12 were much more precise than the bombs the airbase had at its disposal earlier. Russian Foreign Ministry spokesperson Maria Zakharova said on Sept.22 that Moscow was concerned about the pending modernization of U.S. nuclear weapons in Germany.